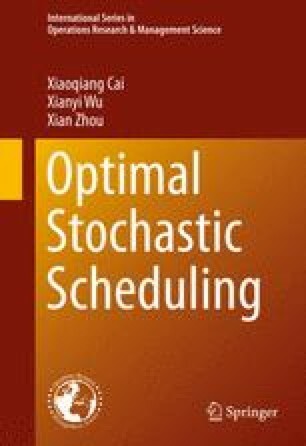 This chapter covers stochastic scheduling problems with regular performance measures. Section 2.1 is focused on models of minimizing the sum of expected completion time costs. In Section 2.2, we consider the problem of minimizing the expected makespan (the maximum completion time). Some basic models with due-date related objective functions are addressed in Section 2.3. More general cost functions are considered in Section 2.4. Optimal scheduling policies when processing times follow certain classes of distributions are described in Sections 2.5 and 2.6, respectively. Basic techniques commonly employed in the field of stochastic scheduling, including the approach of adjacent job interchange, the argument of induction, and the approach of stochastic dynamic programming, are illustrated in this Chapter.